The Hiscox Insurance customer service number is 0120 677 3777. This number is useful if you want to know about the latest product offers. You can also request for policy changes, check the status of your claims, make claims or ask any general questions about the insurance coverages offered by Hiscox. You need to know various other numbers in order to directly voice out your concerns to the appropriate department aside from this number. The Hiscox home insurance free number is 0800 247 1902. The UK-based experts of Hiscox are ready to help you with your home insurance concerns. The Hiscox Home Insurance quote free number is 0808 256 8825. You need to provide your contact details and your selected insurance product to get a quote. If you’re a policyholder who needs confidential counselling, call 0117 934 2121. You can get a counselling session via your telephone. Contact on Hiscox travel insurance phone number 0330 660 0751 if you want to avail of Hiscox Travel Insurance or if you want to ask about the coverage of the policies. For policyholders who need international medical rescue, call 0208 290 4442. For other medical emergencies that you encounter, call for help at 0207 902 7990. In case you’re abroad, and you need to be evacuated due to natural calamities, political unrest, call the travel evacuation number 0203 291 2424. There are different help phone numbers that you can use depending on what service or product you need. To make claims or to relay your enquiries, call the 0808 271 8684 free number. The people from the Hiscox customer service team will guide you through the process to smoothly make claims. Before calling, prepare your policy number for easier transactions. You can call this number to ask about the different insurance policies issued by the company. Hiscox number for Professional Indemnity is 0120 677 3899. You are required to get in touch with the help team if any customers want to make claims against your organisation. You can also call this number if you want to make claims for your business property. A claims underwriter will respond to your request. To make claims for personal accidents policies call 0208 315 0732. The Hiscox Personal Accident Insurance is a business insurance product. You can call the number to learn about the coverage of the policy such as funeral expenses, lump sum payments, recruitment expenses and retraining budget. There are different Hiscox regional offices scattered across the UK. If you want to talk to a Hiscox broker in charge in your area, call the designated numbers. For clients from Birmingham, the Hiscox phone number to use is 0121 212 5902. If you are from Colchester, reach out to the appropriate Hiscox help team at 0120 678 8874. There are brokers located in this area, you can talk to them using the provided phone number. The Hiscox contact number for customers from Scotland is 0141 285 6511. If you wish to visit their office, call the number first. Call the same number as well to make any enquiries about the company’s Scotland-based brokers. Hiscox also has a branch in Manchester. Call the number 0161 245 3350 for your concerns or queries and appointments if you are from Manchester or if you wish to visit the branch in this area. Another Hiscox branch is located in York. If you are from York and you need a broker for your insurance queries, get in touch with the Hiscox help staff through 0190 468 1023. Aside from the contact phone numbers provided above that correspond to the different products and services provided Hiscox, there are also other important numbers you need to take note of. If you need to reach out to Hiscox’s Press team call 0207 448 6656. Look for Kylie O’Connor, the head of the communications group. Another option is to send your concerns via customer[email protected]. Apart from the address and the email, Hiscox can also be contacted through their social media pages. How to Find Hiscox Customer Service? Hiscox is an international insurance company that specialises in underwriting various insurance policies for both personal and commercial clients. To find which Hiscox contact number to use when you need assistance, go to Hiscox Insurance site. Scroll down to the bottom of the homepage to locate the Making a Claim tab. Click on the link that says “contact our claims team” and you will be redirected to a new page. On the Contact Us page, you will find the necessary links that will give you the correct Hiscox number to call. The Footasylum customer service number is 0170 671 4299 local rate number. This number is available Monday through Friday from 8am to 10 pm, and on Saturdays from 8 am to 7 pm. It will be closed on Sundays and all bank holidays. The customer service team is prepared to take calls for orders, returns, complaints, and other general enquiries. If you have an order already, make sure you have the details to that order ready to give to the service agent on the other end of the telephone. The Footasylum head office number is 0161 746 8722. While they may have over 40 stores within the country, their head office is situated in Manchester. Besides calling, feel free to utilise their online interface feature to reach out to their customer service team. You only have to fill in the form on their Contact Us page, and your requests and queries will appear in their email inbox shortly. If you are unsure why you need to even contact Footasylum, maybe it is best for you to visit the Footasylum FAQ page. You will find that they have provided the answers to a lot of frequently asked questions. Maybe your answer is already there. Footasylum developed an online order tracking service to make tracking your order easy. When you reach the page, you have to select your delivery destination. Then you have to key in your tracking number and postcode. And voila! You have tracked your order. You can choose the standard delivery option or the next-day delivery option with this. With the standard delivery option, you can expect your order to be delivered within two to four business days. If you are not available or you think your home is not a safe place for delivery, you can opt to have it dropped at the local ParcelShop. When the item arrives, you can go pick it up. You also have the choice to have your item delivered to the local Footasylum store for free. Just place and order and select the store, and you are good to go. Once you make a purchase with Footasylum, the company guarantees a refund or exchange of any item for free within 14 days of purchase. This is also applicable to all returns. They will try their best to process everything in seven days so that they can get back to you as soon as possible. Collect Plus – a fully tracked service in the country. This means that they will be able to track the item’s whereabouts until it reaches them. You have to print out a label, fill out the form, and attach it to the parcel. After that, you can just drop it off at the nearest Collect Plus location. ASDA – in collaboration with the ASDA-to-you-service. If you choose this service, please create and print the label, attach it to your parcel, and bring it to the nearest Asda store. Return to store – if you have a Footasylum outlet nearby, then there is no need to use any of the methods above. You just have to bring the item over to the nearest Footasylum outlet and request for a return. Of course, you have to bring the receipt as your proof of purchase. Join Footasylum and help them in their efforts to improve their products and services. In the event that you are interested, you can always look for vacancies by visiting the Footasylum Careers page. If there is a position that suits you, feel free to seek for more info and apply for it. There are many ways to contact Footasylum, than the traditional telephone or website interactions. Apart from these, you can also reach out to the company through their social media accounts. They have set up numerous social network outlets that all youngsters are into so that you can contact them that way if you prefer to. MCE Insurance contact number is 0193 335 1361 this is a Geographic numbers and it cost no more than any other local rate number – 13p per minute from landline and 3p and 55p per minute from mobile, the customer service department is open Mon-Fri: 8.30 am – 9 pm, Sat: 9 am – 5 pm, Sun: 10 am – 4 pm. Explore more about products on the MCE insurance home page. In addition, feel free to visit the main contact customer service page to explore more options. For an example, you can use the online contact form or the chat option on this page. The chat option is available during the usual business hours. The MCE Insurance claims number is 0193 335 1528. This is a service open 24/7/365. Use this number only to report a claim for loss or an accident. You may not need to fill out any forms initially but just provide the full story to an MCE representative. Furthermore, the MCE Insurance claims page has detailed information on how to file a claim and what it expects from you for faster settlement of the claims. Your MCE breakdown insurance policy booklet has detailed terms and conditions. Please go through these pages before reporting a breakdown. In addition, make sure that your breakdown policy is in effect, as each policy is valid only for one year and requires renewal every year after the first one. MCE offers services to Irish residents and nationals as well. Please use the MCE Insurance Republic of Ireland number 0818 275 788 to get quotes and other specific details for your region. You will find more details by visiting the MCE Irish Only page online. The MCE bike insurance number is 0844 338 6888. This helpline is suitable for buying a new insurance policy for various types of personal and commercial use motorcycles. Moreover, you can buy MCE protection for speciality bikes like motorbikes, mopeds, classic, multibikes, scooters, as well as, quad and Chinese bikes. , You can request a quote online by visiting the MCE motorbike insurance page. Fill in the requested information and obtain the quote in a few simple steps. The MCE car insurance number is 0844 338 6898. Customers can visit the MCE car insurance page and obtain a quote online instantly. It offers these premium protection solutions for all types of cars including sports or performance cars. Moreover, MCE offers windscreen or breakdown cover in addition to the comprehensive car insurance products. Therefore, explore the privileges of club MCE membership when you purchase insurance product for your car. Finding the best protection online is easy with MCE. The MCE van insurance number is 0844 338 6878. You can visit the MCE van insurance page to learn more about quotes and other van products. Please remember that new van insurance products are not available for customers from the Republic of Ireland. The MCE courier insurance number is 0844 338 6799. This is tailored to serve customers with bike courier activity. You can ensure all the bikes from the fleet at once by requesting a quote over a phone. Similarly, visit the MCE courier insurance page and submit your requirements of protection online to receive a quote via email. Moreover, specialists at MCE design insurance product to meet your requirements of protection. The MCE convicted car and van drivers insurance number is 0844 338 6860. Learn more online about convicted car or convicted van drivers insurance. This type of insurance offers cover for people with a history of careless/reckless/dangerous driving, disqualifications, drink or drugs cases, and offences for accidents, licences, construction & use, motorway, insurance, and miscellaneous offences. In addition, the experts at MCE offer these special quotes with the due consideration of the fact. Therefore, visit MCE food and delivery bikes insurance page for more information on available products. How to Contact MCE Insurance on Social Media? MCE Insurance is present on Facebook, Twitter, and LinkedIn to share the latest updates and trending in the industry. In addition to sharing social media with customers, MCE participates in national and international motorcycle shows. Thus, it engages in continuous interaction with customers on various platforms. Therefore, stay tuned with MCE on these pages for live action and the latest you ought not to miss. Why Do You Need To Contact MCE Insurance Customer Service? Therefore, feel free to use various ways to contact MCE Insurance and seek the assistance. They are available throughout the week and the claims helpline is open 24/7/365. Moreover, the UK based call centre by MCE provides state-of-the-art assistance to customers. The Odeon Customer services number is 0333 006 7777 local rate phone call, press #1 for film times and prices and press #2 for customer service. You can call this number from 9 a.m. to 6 p.m. Monday to Thursday, 9 a.m. to 7 p.m. Saturday and Friday, and 10 a.m. to 5 p.m. Sunday. If calling is not a method you prefer, you can also try their live chat system. Nevertheless, there are still other ways to contact Odeon if you choose to contact them outside of their opening times. You only have to fill out this online form, and your requests and queries will be directed to the Odeon email inbox. The Odeon Limitless discount telephone number is 0333 004 4411. As a Limitless member, you have the privilege to a number of benefits that other members will not be able to enjoy. The Limitless program allows you to watch as many movies as you like for just a low monthly fee. They have two kinds of Limitless packages available, with or without Central London. The Odeon bulk cinema vouchers can be easily redeemed at any and every Odeon cinema near you. Odeon is already making the cinema experience special for their customers. Nevertheless, with an Odeon voucher, you can get up to 38% of discount, which makes it all the more special. You can always contact the Odeon phone number above to register, or you can also register for an Odeon gift card or voucher online. The Odeon disability and accessibility helpline free number is 0800 138 3315. Textphone users can contact Odeon on 18001 0808 1560 609. To ensure that their products and services are as widely accessible as possible, the company has even consulted with Freeney Williams Ltd, a specialist agency, to observe, assess, and review their various cinemas and services. Even their website is specifically designed to be simple and easy, so that it is easily accessible for all kinds of individuals, regardless if they are disabled or not. If you are looking for a venue to organise an event, you can always call the Odeon business events and experiences number 0207 766 1895. On this Odeon helpline number, you can submit enquiries about their available dates and such. They also let you place requests to book venues for certain dates on this number. You can also submit your enquiries or requests by filling out this online enquiry form. With Odeon conferencing and events, they will commit themselves to the process of making your corporate event something that has never been seen before. They will, of course, follow your budget, so that you can stay within your budgetary confinements. One thing you can be sure of is that your corporate event will benefit from the company’s wonderful facilities, excellent technology, and the assistance of their expert event planning team. You can find the best place for your event when you use their venue finder tool. They have over 200,000 seats in more than 100 locations across the country. This means that wherever you are, there will definitely be a venue for you to host your event. The Odeon Conference and Events number is 0203 582 6339. They will offer the same dedication they do for corporate events and help you in throwing the best party they can manage. If you have an event in Ireland or need assistance from that part of the world, the Odeon Irish number you ought to contact is +353 (0)1 686 9460. The products and services are similar to the usual Odeon Cinemas. Acquire all the updates and latest news at Odeon Cinemas when you follow all of their social media accounts. By following them on their social network outlets, you will get to know about the movies that are going to be on air soon. They will also be able to let you know about the latest deals and promotions they are implementing in just a moment’s notice. Not only that, their social network outlets also enable you to reach out to them through another communication channel. The Go Outdoors customer service number is 0330 008 1555. The number is available all week long. Monday to Friday: 8 am – 7.30 pm. Saturday: 9 am to 5.30 pm. Sunday: 10.30 am – 4.30 pm. The helpline is closed on all bank and public holidays. Besides calling, you can also choose to write them an email. To send your email of request or query, keep in mind that the Go Outdoors email address is [email protected]. What Delivery Services Does Go Outdoors Offer? The company has partnered up with UK Postal Service. They believe that the outdoors should be accessible to anyone, which means that even if you are not able to get any Go Outdoors products personally because there is no Go Outdoors store near you, you can still purchase their products by going online. How to Return Go Outdoors Products? You are entitled to the right to a full refund, repair, or exchange within 30 days of purchase. There are three options for you to return the product: return to the local Go Outdoors store, and via Collect Plus, Royal Mail or courier. Find the Returns link at the bottom of the web page. It is as this part of the website that you will create your return note for one of the local agencies that will perform the transfer of your return. When you return the product in any of the methods they allow, you are mandated to attach such a delivery note to it. You can download the delivery note online. As long as you hold on to your receipt, you are allowed to return the item to any local Go Outdoors store. You have to ensure that the product is in a resalable condition, which means including the packaging and tags. To look for the nearest Go Outdoors store, you can use the store locator tool they provide online. Collect Plus is recommended, given that it is a fully tracked service, which means that your returned product can be tracked from wherever it is until it reaches the company. You need to ensure that the parcel does not weigh over 10kg or exceed dimensions of 60 x 50 x 50cm. When you pack your parcel up, please pack it up in the original package. However, you should also remove the delivery label. Once packed up, you can drop it off at the nearest Collect Plus location. To look for the nearest Collect Plus location, you can use this tool to do so. Why do I need a Go Outdoors Discount Card? You only have to enter the town you are in or postcode, and they will deliver the card to the nearest Go Outdoors store. The company will deliver the card to your home. If you are a customer from abroad, they also provide the service to have the card delivered overseas to your doorstep. How can a discount card from Go Outdoors help you? Well, whenever you are shopping at Go Outdoors with the discount card, you will naturally be privileged to a 10% discount off the retail price of everything. Secondly, if you manage to show them a competitor who sells the same product at a cheaper price, they will beat the price by another 10% if you prove that you are a discount card holder. Besides that, as a discount card holder, you can also be the first of all Go Outdoors customers to enjoy the exclusive offers and deals that the company always manages to come up with. Your Go Outdoors discount card will be valid for one year only. To continue using it after one year, then you have to renew it at an additional £5 fee. After a £50 purchase, you have already saved the amount spent on the annual fee. Go Outdoors developed an online tracking tool with the hopes that it can help you in alleviating your anxiety and worries. When you are using the online Track My Order tool, you have to key in your email address and the order reference number. Once keyed in, they will show you where your order currently is. If you do not know what your order reference number, you should be able to find it when you log in to your online Go Outdoors account. There is also an option for you to get in touch with Go Outdoors on social media. When you follow them on the social network outlets, you will be able to keep up with their latest updates as well. Contacting the sales team or customer service team is simple. Visit the contact us page on the web and fill up the online form to get in touch with a specialist. They deal with your enquiries and offer assistance on how to maximise your revenue and customer satisfaction as well. London General Insurance automotive claims assistance contact number is 0330 100 3287. Use this number for quick response and resolution to your automotive insurance claim as well as extended warranties that accompany your policy. 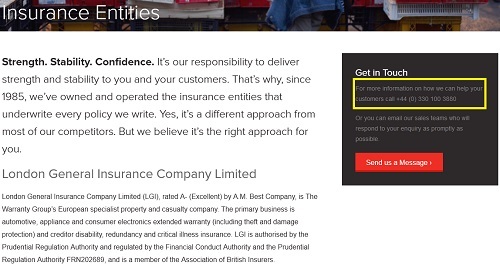 You can contact London General Insurance by visiting the claims assistance link. The page has detailed information for you. However, please review your policy document for assistance as the document contains required information. Moreover, you can always contact claims department during the need for help. London General Insurance other claims contact number is 0330 100 3887. Get answers with your enquiries regarding appliance and consumer electronics extended warranty, which includes theft and damage protection, creditor disability, redundancy and critical illness insurance claims. They are always ready to respond especially when unexpected damages covered by your insurance happen. People at London General Insurance understand the significance of a loss. They are always ready to assist with a phone call. You can contact for assistance during reporting a loss of automotive, appliance and consumer electronics extended warranty (including theft and damage protection), and creditor disability, redundancy and critical illness insurance services. The London General Insurance retail business number is 0159 486 3000. It is also for auto dealerships assistance and enquiries. Contact on this number to know the company’s business partners with in order to deliver effective value added warranties and insurances to clients. Similarly, visit the details page on the web for more information about services offered. This includes gadget and technology insurance, appliance insurance, jewellery and watches insurance and home entertainment insurance. If you have further questions, contact Shaminder Rai, the Customer Transformation Director for enquiries. Call in or send an email to: [email protected]. Aside from this, you can also ask for assistance on how to increase your return on investment and enquiries about insurance protection and additional coverage on automotive insurance. With the well-designed warranty programme or service plan, you can have a warranty for your vehicles and protection for your cars, motorbikes, tractors, and more. Nevertheless, you can also get assistance and solutions with your concerns about customised warranty programmes, mechanical warranty, service plan products, vehicle asset protection, tyre and wheel, key loss, MOT insurance and technical support. Moreover, visit the auto dealership page to download the automotive brochure for additional information. Contact the Vice President of the Warranty Group for Auto Europe, Mr Justin Woodman for additional inquiries and learn more about available options. Call or send Justin a message: [email protected]. London General Insurance manufacturer – appliances electronics/technology furniture assistance and enquiries contact number is 0772 049 8031. Visit manufacturers page or get in touch with Simon Harrison, European Business Development Director of The Warranty Group UK to learn more. Reach him via email at [email protected]. How to Contact London General Insurance Limited using Warranty Group UK Social Media accounts? 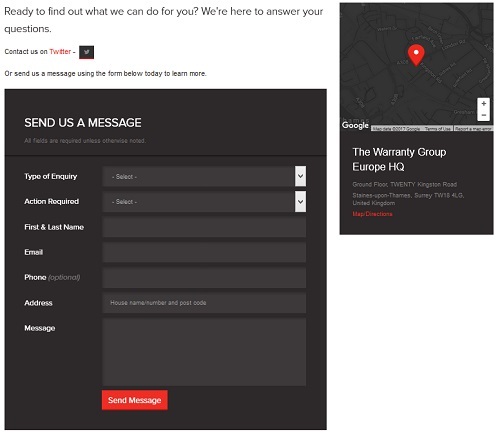 The Warranty Group assists customers on social media. Therefore, feel free to use these channels to express yourself. @SamuelMay0 Hi Sam, that’s not a direct number to us. If you try 01633 654 019, you'll get through quicker. The appropriate Go Compare customer service phone number to dial is 0163 365 4019. You can submit any form of enquiries and requests. Or if they are unable to help due to the fact that it is not in their level of expertise, the Go Compare representative will redirect you to the correct department so that you can get the answers and clarification you need. The point is that once you call them, you are guaranteed to be able to hang up with the information you require to make a decision. Apart from calling them, customers can reach out to GoCompare via email, [email protected]. When you deliver the letter, please remember to include your contact details. This is so that they can get back to you as soon as possible. Members of the press can acquire materials for their news stories by visiting the online the GoCompare.com press office. There, you will be able to search for the latest news releases of GoCompare. They try to be as transparent as possible. Nevertheless, you have to understand that they may have to keep some details on the down low and they will not be able to offer you those details. To reach out to the GoCompare press office, you can contact Anders Nilsson via his GoCompare number 0163 365 4054, or email him at [email protected]. In case you can’t reach him, his partner Martyn John is reachable on the GoCompare contact number 0163 365 4725. Or you can also email him at [email protected]. Nick Wrighton is the Chief Financial Officer for Gocompare.com. You can be in touch with him directly for any investor enquiries. You can call his investor relations centre at 0163 365 5051. You can also choose to reach out to him by sending an email to [email protected]. Now, if you are a shareholder, and you wish to enquire about the company’s financial status, you can call the international GoCompare shareholder number +44 (0)121 415 7047. If you are within the UK you can also opt to call the 0121 415 7047. You can also reach out to Go Compare via social media if it is the method you prefer. The Just Eat contact number is 0344 243 7777 local rate 034 number. This number is available for Just Eat customers between 10 am to midnight daily. Finding out you’re Just Eat order status is simple for customers. Simply go to the main website and click the Log in Button at the top right of your screen. You will be redirected to a sign-in page. You can sign in via your Facebook account or by registering with the online option. The mobile app will directly connect via your Facebook account if you are already logged in on your mobile device. The Just Eat online order registration number is 0203 370 9922. Once you register online for ordering you never have to do so again. Your credentials are kept in the system, you just need to open your account online or your mobile app. If you have concerns or questions about this process do not hesitate to call the registration number above. Make a suggestion today so others can experience good dining as you see best. Send an email to [email protected] to recommend a new outlet for others to eat, rave, rant, and share with others too. Diners across the United Kingdom can recommend a restaurant or takeaway to Just Eat. They can fill the online request form for the same. Then the sales team adds that information to requested restaurant listing for further contact and processing. This helps in adding your favourite restaurant or takeaway to Just Eat listing. Interested individuals can suggest a new listing over the phone or by sending email as well. Reaching the head office in person is easy. You need to take Holborn viaduct exit at City Thameslink station. In fact, the head office is located right above this underground station. In addition, you can walk for about five minutes from St. Paul’s or Farringdon and reach Just Eat head office. Additionally, you can reach out to the corporate websites. These offer opportunities for people to either start a career or graduate career with Just Eat. There are listings of internships, full-time positions, benefits and much more. The Just Eat Press and Media number is 0207 404 5959. Request to speak with Sarah West. Similarly, you can visit the press and media page online and know more. This page has updates, financial information, and bytes for the press. Just Eat offers a press releases page for media grabbers. In addition, Just Eat has innovative Accelerator programme for FoodTech entrepreneurs. Know more about the opportunity if you are an entrepreneur on a lookout for an opportunity to grow on Just Eat accelerator page. The Just Eat Investor number is 0203 667 6961. Ask to speak with Adam Kay. Moreover, the Just Eat investors page has information about key financials, results, share price centre, reports, governance, RNS, financial calendar, and shareholder information. Therefore, interested individuals and financial analysts can use various links on this page to explore more options and information. The Just Eat help page has answers for most commonly asked questions. In addition, you can click on a listed problem to get the precise answer. Over 117K Twitter followers share the same platform with Just Eat. The latest updates, trending, and much more offered on these social media channels make the conversation crispy and tangy. In addition, mobile app versions of the online interface are available for iOS and Android smartphones. Similarly, the Just Eat blog shares a plethora of information and updates for its readers. 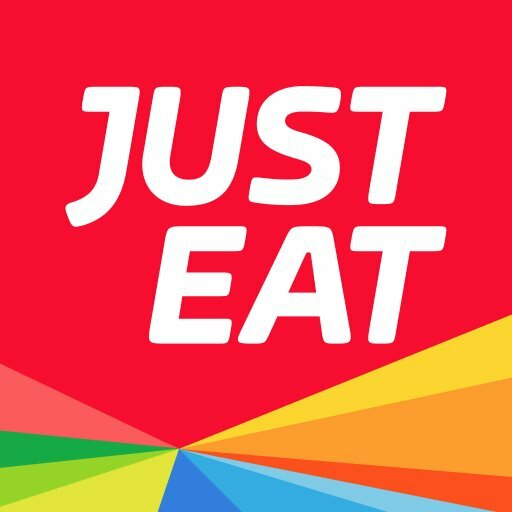 Finding out more about Just Eat is amazing especially when you are interested in the information and updates. @sajaadkhan… contact Harrods on 0207 730 1234 and a member of staff will be happy to assist you. Please note that the store opens at 10am. You can easily reach out to the Harrods customer service team when you call the Harrods customer service number on 0207 730 1234 local rate number. Harrods is undeniably one of the most popular fashion retailers in the country. Hence, you can’t be blamed if you find their operations a little confusing and you need their help to navigate around the website. Apart from calling, you can also choose to send them an email instead. To send an email to Harrods is fairly easy. You only have to fill out the online form that is displayed on the Harrods Contact Us page. As per usual, they will ask you to leave your name, your contact details, and your request or enquiry. They will get back to you in forty-eight hours at most. The above contact methods are also for you to register a complaint. There may be times when you are unsatisfied with the services and products they have provided. Perhaps the product delivered to you is damaged or unmatched to your order. Maybe you are the recipient of a bad customer service. In any case, they will more than happy to help you in resolving the issue. In some cases, you may even be compensated for the loss you have suffered. However, you will need to give them time to see if your issue is suitable for compensation. Online ordering is a huge trend these days. And for a fashion giant like Harrods, it will be a crime if they do not offer the option for their customers to purchase their items online as well. All you have to do is log on to the Harrods official website, and you can browse all the catalogues they provide online as much as you wish. If you see an item to your liking, you can just place your order, key in your contact details and home address, and it will be delivered to your doorstep in no time. Nevertheless, it is always better if you register an online account with Harrods. This way, you will not have to repeat the process of keying in all the details whenever you feel like ordering from Harrods. If you have any confusions about ordering online, feel free to get in touch with the Harrods buying department telephone number 0203 626 7020. You can also choose to write them an email instead. The appropriate email address for Harrods online orders is [email protected]. Harrods seems like an interesting workplace for you? you can always seek for vacancies on the Harrods Careers page. And if any of the positions interest you, feel free to ask for an interview when you contact the Harrods recruitment number on 0333 300 1000. It is a once in a lifetime princess experience for your child. If you are would like to give your kid the chance, you can always make an appointment on the Harrods Disney store phone number 0333 300 1234. You can also email them at any time at this email address: [email protected]. When you make an appointment with them, they will immediately go about in preparing everything to ensure that your children will get the best of the best Disney experience. Oh yes, Harrods has a Disney store within. They call the Disney store Bibbidi Bobbidi Boutique. This is a store that specifically sells Disney-branded products. From Frozen dresses to Beauty and the Beast merchandise, they have it all. Your children will surely love the Disney experience they are certainly going to get at this boutique. Did you just move homes? Are you looking for furniture that suits your new home? Well, then you have come to the right place for luxurious furniture at Harrods. They provide the most comprehensive catalogue of furniture items in the United Kingdom than any other retailer in the country. If you are interested and you wish to learn more about it, feel free to dial the Harrods furniture contact number 0203 626 7911. You can place a booking at the Georgian restaurant in Harrods when you dial The Georgian restaurant phone number on 0207 225 6800. You can also do the same online. Just head on over to the Georgian Restaurant web page, and click on the ‘Book Online‘ option. These levels are all dependent on your spendings. When you spend £1, you earn one point. Once you reach a certain spending amount or points, they will automatically upgrade you to the next level. When you are upgraded to the next level, you will be able to enjoy more benefits than the ones you got to enjoy in the previous level. Surely you must know that calling, sending emails, and writing letters are not the only communication channels to get in touch with Harrods. You can also reach out to the company through the various social network outlets they have established. By following them on their social media accounts, you are privileged to not only another option to get in touch with them but also regular updates about the infamous retailer.